The page header for student curriculum details has been redesigned to align with student summary data throughout the application and to include detailed summary information. We’ve also moved the print icon to a more visible area so that educators are able to more easily print details. You will find a new icon/flag for courses that are not included in the program course catalog (designated by a hazard sign). Additionally, to streamline the section creation process, administrators will now be able to search for educators by username in the Browse Instructor Directory. Three new data points have been added to the Courseware Audit Report as requested: Gender, Federal ID, and State ID. Those are on top of the other 29 fields available for this report. Instructors will now have the ability to approve credit for multiple learners within the Gradebook with the new multiselect/select all functionality. 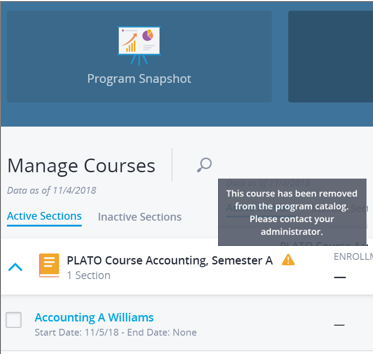 The manage credits feature can be enabled through the Account/Program Gradebooks, as well as individual Section Gradebooks. 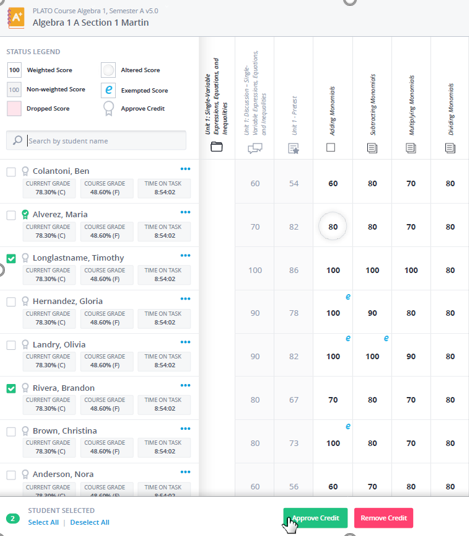 Instructors will have the ability to create and assign optional activities to students, as well as to easily drop and reset scores in an effort to provide further flexibility to customize Courseware based on your particular program needs. Stay on top of further enhancements (and read about past enhancements) by visiting Edmentum’s What’s New Page for Courseware. We’re looking forward to feedback about these new changes and additional enhancements that you’d like to see in the future!